After United's twelve year association with Adidas came to an end, the Club went with a new manufacturer for the 1989/90 season, Japanese Sportswear Manufacturers ASICS, whose new design was similar to the previous few seasons, where the Away strip was a white version of that seasons Home kit. The main design of the kit was similar to the previous seasons Adidas effort, with a diagonal pattern and shirt manufacturer’s logo throughout the top, enhanced with an occasional horizontal dual stripe. Again, a black V-neck collar and black cuffs were used, with a white and tangerine line included. 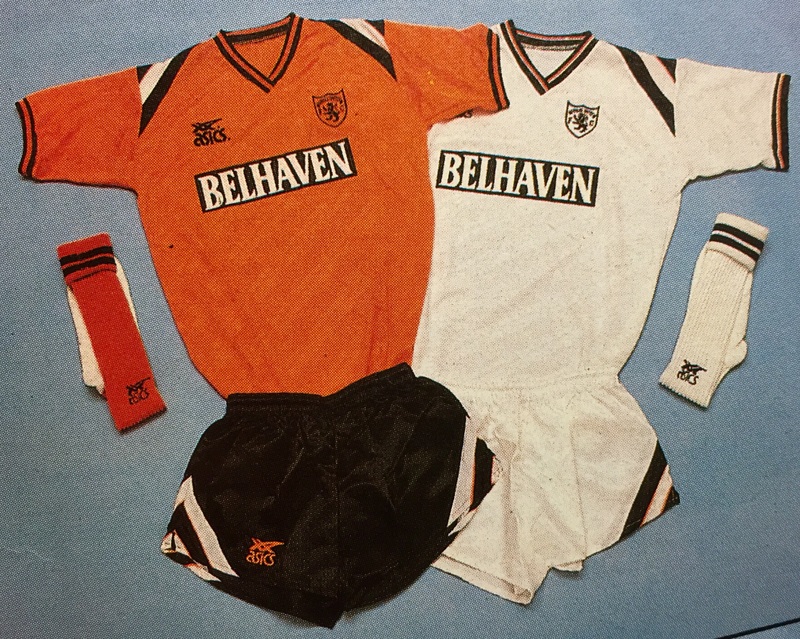 The striking white and black Belhaven logo remained, as did the Club's lion rampant crest. However, a main change to the design was the inclusion of black and white triangular panels on both shoulders. The white shorts included a black and white triangular panel on each side. The socks were white with black trim. The Away kit made its first appearance during Paul Sturrock's testimonial match against Real Sociedad on the 6th of August, 1989. For this one off occasion, a different sponsor was on the shirt, the match sponsor Scott Oswald & Company. It made its competitive debut against Hearts at Tynecastle on Saturday 23rd September 1989, in a 1-1 draw where Hamish French scored for United. The ASICS kit deal lasted for two years, and the second season continued with the same design as before. The Belhaven shirt sponsorship deal also continued, with the Scottish brewery's logo appearing on the tops for the fourth consecutive year. The ASICS Away strip's last appearance was the incredible 1991 Scottish Cup Final against Motherwell.